Whenever you read a glowing review of our practice online, it’s likely that you will see Mandi mentioned by name. 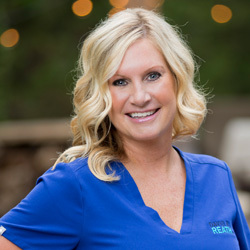 Kind, caring and detail-oriented, Mandi has been a patient favorite since she started with our practice in 2002. Working side by side with Dr. Reath, Mandi takes the time during clinic to listen to patients while kindly and expertly guiding them through the surgery process. Mandi is famously known as a “sizer sister” because of her close work with our breast augmentation patients. She has literally helped thousands of women pick out the size of their breast implants. She will not steer you wrong. Where she really shines is in our pre-op appointments. Mandi is the one who will help you finalize all the details prior to your surgery from what vitamins to take to when you can shower afterward. Her experience, patience and hand-holding are so reassuring to patients who are a little nervous just before and right after their surgery. One secret we all know about Mandi is that she is very particular about her skin care products. If it passes the Mandi test, then you can be assured it's good. She particularly likes Brightamin C and Calm After the Storm.